A pair of ten-year-old kids, Travis (James Freedson-Jackson) and Harrison (Hays Wellford), walk together while trading off curse words they've learned. The friends have run away from home, but the seemingly endless fields they traverse, under expansive blue skies in a desolate small town, make it look like a futile escape when faced with the seemingly endless terrain. They stumble across an abandoned cop car in a clearing and, before they know it, daring each other to simply touch it has suddenly turned into a joyride for the duo. There's not a whole lot of set-up to the languidly paced Cop Car, but the offbeat thriller expertly utilizes its few characters, spare dialogue and captivating vistas to slowly ratchet up the tension until it's eventually reached a fever pitch. It doesn't deal in deceptive twists and turns, but takes a simple and effective approach, adhering to the old principle that the gun in the first act will go off in the third, except in this case the gun is a mysterious man lurking in the trunk. 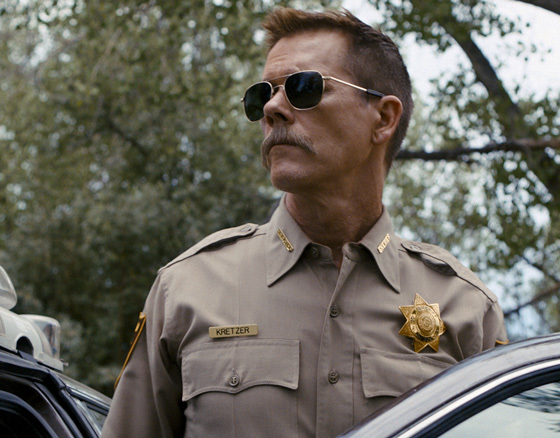 Once the kids have made off with the cop car, we double back to how and why it was left there in the first place by the town's Sheriff (Kevin Bacon). It seems he was busy disposing of one of the two bodies he had stowed in the trunk, and when he returns to find the car missing, he fervently starts trying to track it down without alerting anyone else to what has happened. This is made more difficult when a woman (Camryn Manheim) reports to police having seen the two kids screaming past her on the road in the cop car. The film wisely chooses to go light on backstory and exposition, keeping a certain moral ambiguity to its characters by never revealing the circumstances surrounding Bacon's Sheriff and the bloodied men he's stashed in the trunk. There's black humour to be found in the interplay between the two kids, especially in a scene where they discover some guns in the backseat and set about trying to figure out how to use them while brandishing the weapons dangerously close to their face. The way director Jon Watts places the naïve sensibilities of the two children on the run in the path of real danger and sets it against the backdrop of an unforgiving but oddly transfixing landscape recalls the ragged lyricism of David Gordon Green's forgotten 2004 gem Undertow. Like that film, this one moves inexorably towards a tense showdown that delivers a satisfying white-knuckle climax. This is the kind of movie where the children involved don't so much come of age as they are swiftly (and compellingly) yanked out of innocence by cold, hard truths about the kind of violence and cruelty that exist in the world they inhabit.